The last year in the military is an exciting time for most services members. I was so excited to start down a new path, and my mind was flooded with all the possibilities. I was actually planning on returning to University of Missouri Kansas City where I had just been accepted. But after remembering a conversation between my sister and I about Saint Louis University when I was 11 years old, I realized that I needed to apply. I wanted to go to school for Anthropology at first, but I couldn’t take my eyes off of Athletic Training Program a few lines down on the list. After a little thought, I decided that Athletic Training was the major for me, and so I applied and got in. Now here I am four years later doing my clinicals at Saint John Vianney, a school my father used to brag about but had never attended. I am currently under the guidance of Tim Trupiano, ATC head Athletic Trainer at Vianney. I honestly cannot think of a better place to begin my clinical experience. Tim Trupiano reminds me a lot of one of my best friends from the military. Easy going guy that puts everything he can into being great at his job. I couldn’t be more grateful. I am especially thankful to begin my clinical experience at a site without modalities. I think that this is helpful for the sake of keeping things simple. Here I can learn to appreciate a more hands on, bare bones approach to treatment rather than getting lost in all the options. 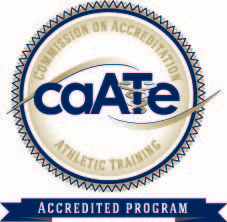 I feel that I am building a solid foundation as I move forward into my future of becoming a good Athletic Trainer.